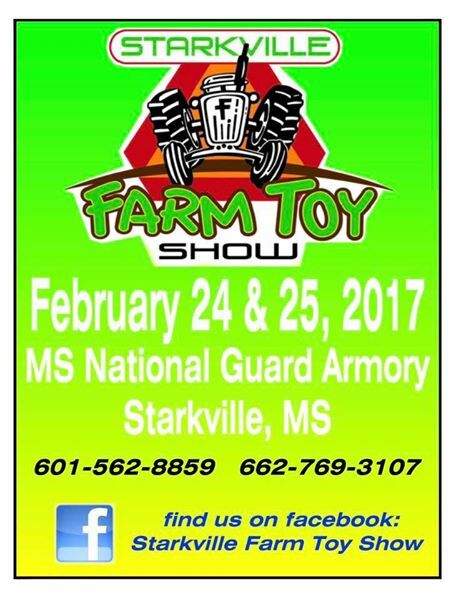 Join Mitch and Pepper at the Starkville National Guard Armory Feb. 24-25 for the annual Starkville Farm Toy Show! They will be displaying their collections, along with many, many others farm toy enthusiasts! There will also be vendors on hand to sell farm toys to start your own collection. It is a NEW LOCATION this year, so be sure to come see the show at the National Guard Armory in Starkville. And on the Tuesday after the show, Mitch and Pepper will be the guest speakers at this month’s JOY Club potluck luncheon as they share their farm toy collections. They will also have their display from the Starkville Farm Toy Show for viewing. Bring a dish and join the fun at 11:30 a.m. Tuesday, Feb. 28 in the fellowship hall of First Baptist Church of Eupora. For more information, call the church office at (662) 258-3491.